The Puppet theatre Ningyo Johruri Bunraku is a very particular example of Japan's traditional stage art in which the main roles are played by large puppets, dressed in elaborate costumes and manipulated by three puppeteers. The text (narration and dialogue) is sung by a narrator who plays all the roles, accompanied by a musician playing shamisen (a kind of lute). The manipulation of puppets, the expressiveness of the narrator's voice as well as the vibrations of the shamisen's strings express all together the intensity of the characters' feelings, and the puppets come to life. The puppet theatre which emerged in the 17 th century and acquired its present form in the mid-eighteenth century, is considered in Japan as a noble form of theatre in the same way as theatre played by actors. Dramatic intensity is always present in Bunraku plays: historic dramas and tragic love stories bringing into conflict feelings with duty. The puppets reflect a remarkable traditional know-how. Their mechanism, hairstyle, clothes and accessories meet precise and strict codes. Although only 160 plays, much shorter than in the past, remain in today's repertory (compared with 700 in the Edo period (1603-1868)), this art cannot be considered as endangered as it is very popular in Japan where numerous young artists are taking over from their elders. 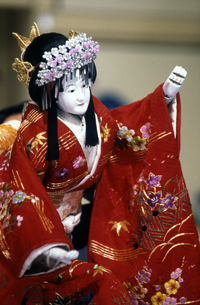 Japan's main objectives within the framework of the " Proclamation of Masterpieces of the Oral and Intangible Heritage of Humanity ", are to improve the visibility of Bunraku (increase in the number of public performances, video recording), to recognize officially the masters of this art, and to put emphasis on the training of young artists.